On the weekend of April 30, 2016, George Ella's hometown of Harlan, KY honored her with a "George Ellabration" featuring music, readings, a play and an art exhibit! You can read about it, and see photos, on George Ella's friend Ann Olson's blog. Absey and Co., publishers of educational books including Where I’m From, Where Poems Come From. Contact them for reprint rights to any materials included in that book. AppLit: Resources for Readers and Teachers of Appalachian Literature for Children and Young Adults includes a bibliography of my work, a bibliography of articles about me, and a lesson plan for using Mama Is a Miner. Louise Borden, longtime writing friend from Cincinnati. We meet halfway between our houses and share manuscripts at a fast-food place off I-75. Her most recent book is The Journey That Saved Curious George. Brenda Bowen, my agent, has a blog, Bunny Eat Bunny. Marie Bradby and I have been sharing friendship and manuscripts for many years. We’re in a writers group together, along with Ann and Leatha, and have taught together at the Appalachian Writers Workshop. Marie’s most recent book is Some Friend. 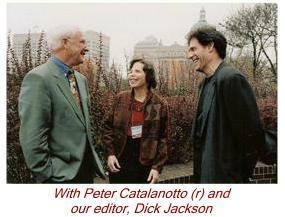 Peter Catalanotto, writer, illustrator, and great friend. We have done eight books together, and have another in the works. Read about his work at www.visitingauthors.com. Bringing Books to Life blog - from the Nashville Public Library. They did a lovely blog post about me and you can read it here. Head of the Holler - in this video, Kentucky writer George Ella Lyon talks with Dr. Chad Berry, director of the Appalachian Center at Berea College, about growing up in eastern Kentucky, finding inspiration for writing and her upcoming publications. "Head of the Holler" is produced by Berea College and airs on the Kentucky Educational Television network. Hindman Setttlement School, in Hindman, Ky.,where I teach every summer at the Appalachian Writers Workshop. The Jesse Stuart Media Award is given by the Kentucky School Media Association to recognize the development of media relating to Kentucky. Paul Brett Johnson, writer and illustrator, is a friend and the illustrator of A Traveling Cat. An Electronic Conversation with George Ella Lyon” is available on video. It was filmed with children in the studio and other classes linked by satellite. First aired in 1997. Everyday Voices,” five half-hour Adult Writing Workshops, is also available from KET. Creating Stories and Music” explores the connections between the two arts for fifth grade students. Also available from KET. Leatha Kendrick, poetry sister and co-editor of Crossing Troublesome. We’re in a writers group and have taught together in a number of venues. 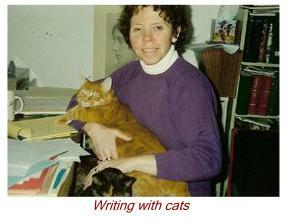 We often write together via telephone with Martha Gehringer, another writers group member. Northern Kentucky One Book One Community is a reading program built around the shared experience of people readnig and talking about the same book. Their 2008 choice was With a Hammer for My Heart. Click here to see the brochure. Ann W. Olson, photographer and writer, longtime friend and collaborator whose work (and farm) appear in Counting on the Woods and on this website. She also did the new photos in A Wordful Child. Potato Hill Poetry, Andrew Green’s organization through which I often do all-day workshops about teaching poetry. Their website publishes hands-on teaching articles as well as poetry by students and teachers. 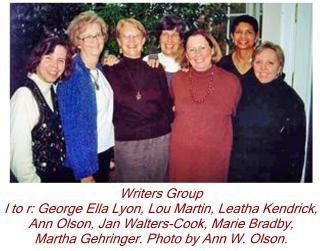 Shepherd College Department of English, “George Ella Lyon—Writer-in-Residence 2001”(November 6, 2001). Something About the Author, vol. 148 (2004), includes an “Autobiography Feature”; with photos, as well as the usual biographical sidelights information and bibliography. The United States of Poetry, an award-winning PBS series which included “Where I’m From” in both print (Abrams) and video (filmed at my house! ), 1996. Visiting Authors.com, which books my jobs and also handles book orders. Wind Publications, publisher of Catalpa and Crossing Troublesome and the online Kentucky Literary News.